Toadette und Nabbit sind nun ebenfalls Spielbar. Super Luigi U ist ebenfalls Teil des Spiels. Auf diesen Titel freu ich mich sehr. 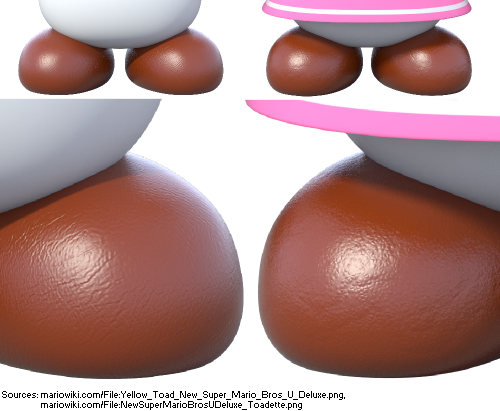 Extremely high-resolution renders for New Super Mario Bros. U Deluxe reveal that while Toad's and Toadette's shoes look identical from a distance, they are actually made from different materials. The leather of Toad's shoes is covered in wrinkles, while Toadette's is bumpy. War heute Morgen auch Thema im Radio. Ich denke das wird noch hohe Wellen schlagen.